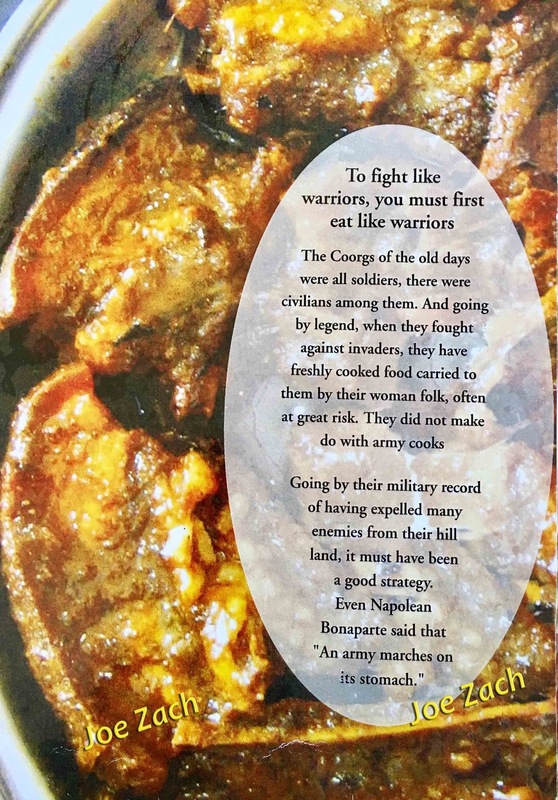 I was reminded of Asterix and Obelix when I read this on the menu card "To fight like warriors, you must first eat like warriors"
Had been to Madikeri (Coorg) last week to attend a wedding. We stayed at a place by the name "Udaya Home Stay" The sight of the hammock right at the entrance makes you feel relaxed. 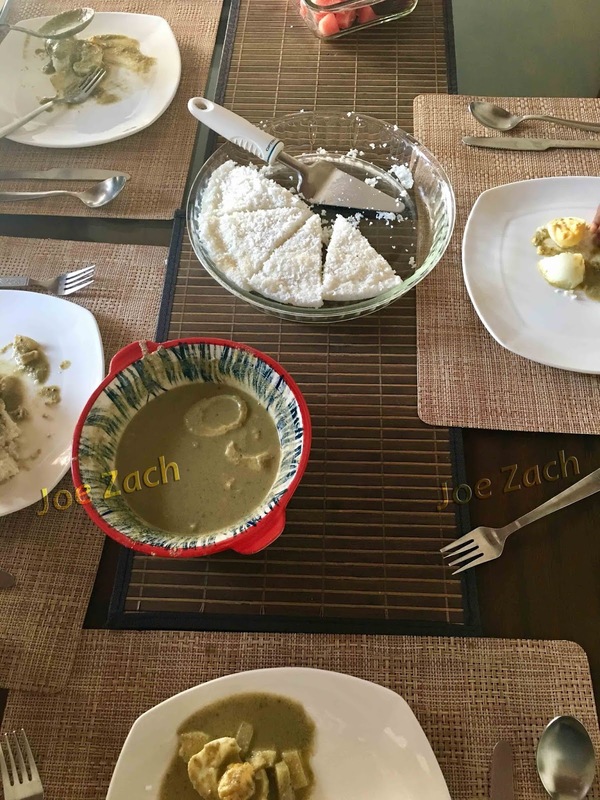 The warmth and the hospitality of the hosts was genuine. Breakfast was complimentary and we had akki roti with scrambled egg and chutney on the first day. The stay in Udaya was just relaxing and we wished we could have stayed for a few more days. One of the eating places that we liked was the Coorg Cuisine (which is opposite the post office) The pandhi curry is one of the popular dishes there and so is the bamboo shoot curry. The above mentioned menu card was from the same place. 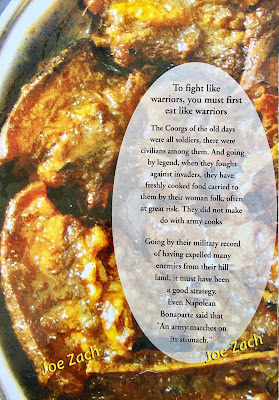 One of the pages from the menu card - Coorg cuisine is known for its meat dishes, the best known would definitely be the 'pandhi curry' or pork curry. The key ingredient, known locally as kachampuli gives the dish a unique sour taste, besides the dark and delicious look. kachampuli's Latin name is Garcinia Gamagachi. It grows in Coorg's rain forest and all along the western ghat mountains surrounding Coorg. Garcinia reduces fat, cools the body, purifies the blood and fights cholesterol. It is used in many Indian Aurvedic preparations. The Kodavas of Coorg is one of the few tribes in India who are allowed to posses a gun without a licence. Visited a Honey bottling plant which was walking distance from Udaya Homestay. I found the area clean and well maintained and the product tasted really good. It was much cheaper than the bottled honey you get in the commercial market. At the town square I found two statues and one of them had these wordings "Lest we forget"
The usual tourist crowd was not to be seen. Probably due to the hyped news by the media about the recent landslide. 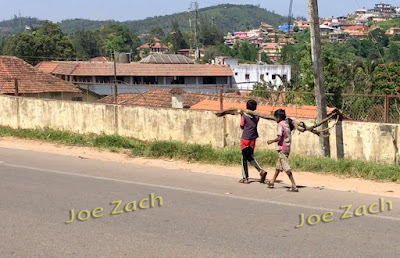 I found these two boys carrying home firewood. Driving down to Madikeri is the best option, but those who don't want to drive, KSRTC Fly buses ply from Bangalore airport to Madikeri. The drive is very very comfortable and the roads are good. On the way back we went by the Airavat bus (again KSRTC) Talking of KSRTC, I found that they are the most efficient and well organised road transport company in India. Very polite and customer friendly. Like that pic of the kids with the fire wood. Your video sums it all up perfectly: the place, the food, the hospitality. Beautiful! I'm familiar with a supplement named Garcinia Cambogia; perhaps it's the sme as the Garcinia mentioned in your post. That is a super quote and the food sure looks yummy! 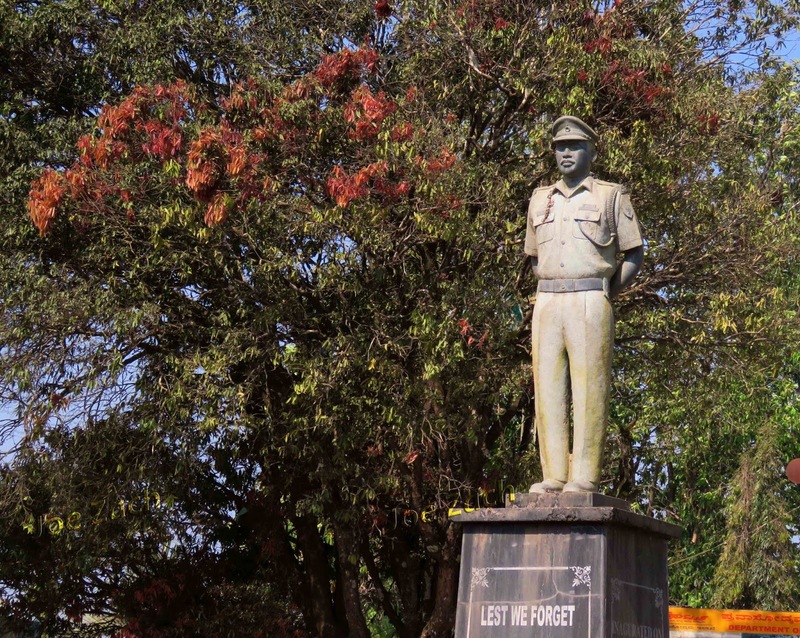 Nice post on a small region in India with an interesting history. A little more on the 'lest we forget' part. The Kodavas of Coorg, with distinctive looks, are a martial race who have contributed many men to the armed forces. Apart from that, sports - especially hockey - is something they are passionate about. Very interesting pist! First time I am hearing someone praise KSRTC, may be times have changed now. Oh, I love Indian food! Sadly my hubby cannot have it... But your post made me want to try to cook myself! The house looks beautiful, too. 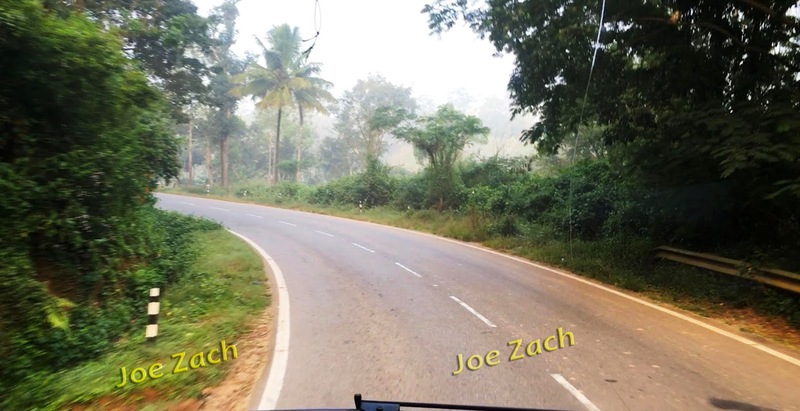 Hi Joe,really enjoyed your blog on Coorg. You've pencilled in all the important information, and I loved the photographs. 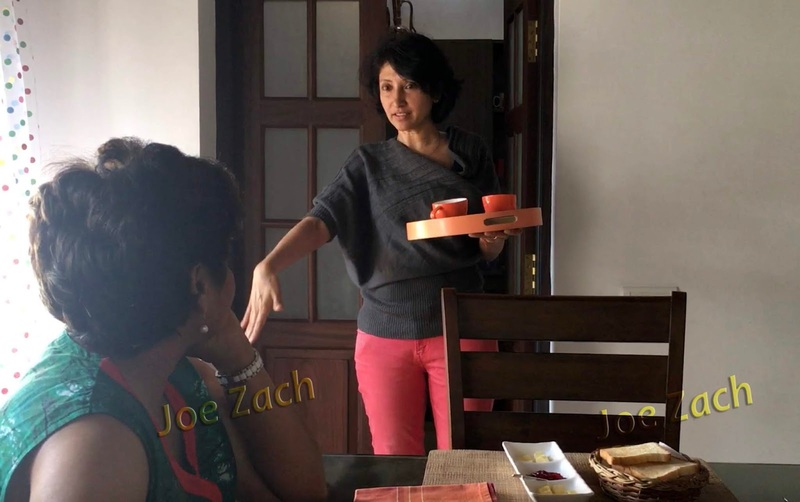 Would you kindly share the contact number of Udaya Home Stay please? The common room at the home looked really beautiful, and I was reminded of the place we stayed in at Kazhiranga. Your hosts in the pics look like warm and friendly people. Along the highway in the video, the countryside is beautiful, hilly and green. The food all looks delicious and I bet the honey is good. That's interesting with the Garcinia, it's new to me. Looks like a wonderful vacation area and the hammock looks very inviting for a little nap! thanks for sharing! This looks like a lovely place to be -- and the food certainly looks delicious! I would have loved to have been with you just for the food! I enjoyed both your written words and descriptions and your photographs.